Let me start off with a piece of mildly interesting trivia, so I can give you the answer at the end: without looking at our roster, which 3 states in the United States have the most IJA members as of our last published roster? We meet again. There isn’t necessarily a lot of news to share with you, but some of the news we do have is pretty exciting, so I didn’t want to wait any longer. For starters, last year we started trying to improve the value of your IJA membership. We dropped the prices, we reinstated the Vendor Discount Program, and we started bringing you high quality exclusive video, including Wes Peden’s Heptad. We always had one more plan in the works, and I’m happy to say that in the February board meeting we made it official. Taylor Glenn has been hard at work producing the festival video for our 2012 festival in Winston-Salem, North Carolina. It should be complete soon, and when it is, it will become yet another benefit for our members! The video will be released in pieces and made available to our members here on eJuggle. I’ve seen parts of it already, and I’m eager to see more. It is great content, and it reminds me what a good time was had last summer. The video will still be available to non-members in the IJA Store, as it always has been in the past. But while I thought an IJA membership was already a pretty good deal, particularly given all the programs you support in the juggling community when you join, this video is the proverbial icing on the cake. Speaking of festivals, we are now only a few months away from the 2013 festival in Bowling Green, Ohio. If you haven’t already registered, what are you waiting for? I did want to clear up a miscommunication: contrary to what was published in the last eNewsletter, the Early Bird registration for the festival ends on April 20th. You know you’re going; register now and save a few dollars. In this day and age, you can’t afford not to. Aside from all the usual great reasons to attend, this festival will mark our return to a college campus setting. Inexpensive, but quality, housing. Open Stage. Busking Competition. A lineup of performers that gets better all the time. It will be more fun than a barrel of monkeys. And any of you who have ever had a barrel of monkeys knows exactly what I’m talking about. On a related note, I recently became aware of something so cool I wanted to share it here. Jim Maxwell is organizing the soon-to-be-legendary Happy Fun Bus. This chartered bus will start in Austin, Texas, and make its way to the festival with stops along the way in Dallas/Fort Worth, Northwest Arkansas, Kansas City, St. Louis, and Indianapolis. If you are interested in joining the bus for festival transportation, more information can be found here. Aside from the fact that I think this is a really good idea for making it easier to get to the festival, I love to see this sort of initiative and cooperation within our community. The only way things like this get done is if somebody steps up and takes the lead. So thanks, Jim. Very cool. Our fourth IJA Video Tutorial Contest is well under way. The prizes are outrageously good this time around, and every time you submit a tutorial you help spread juggling knowledge and help our community thrive. So get out there and make a tutorial! Finish reading my article first, of course. But then get out there! And the trivia question. The state with the third most IJA members is… Ohio. Home of Bowling Green State University, and our festival this year. Second is sneaky. How many people out there guessed… Minnesota? It turns out there is an unnaturally large cluster of jugglers in Minnesota, for some reason 😉 In fact, the city of Edina has more IJA members than 35 states, if I counted right. Are you folks really gonna take that? Get out the membership in your state. And in first, with more than 1 1/2 times as many members as Minnesota, is my home state of California. Because we’re just that good. 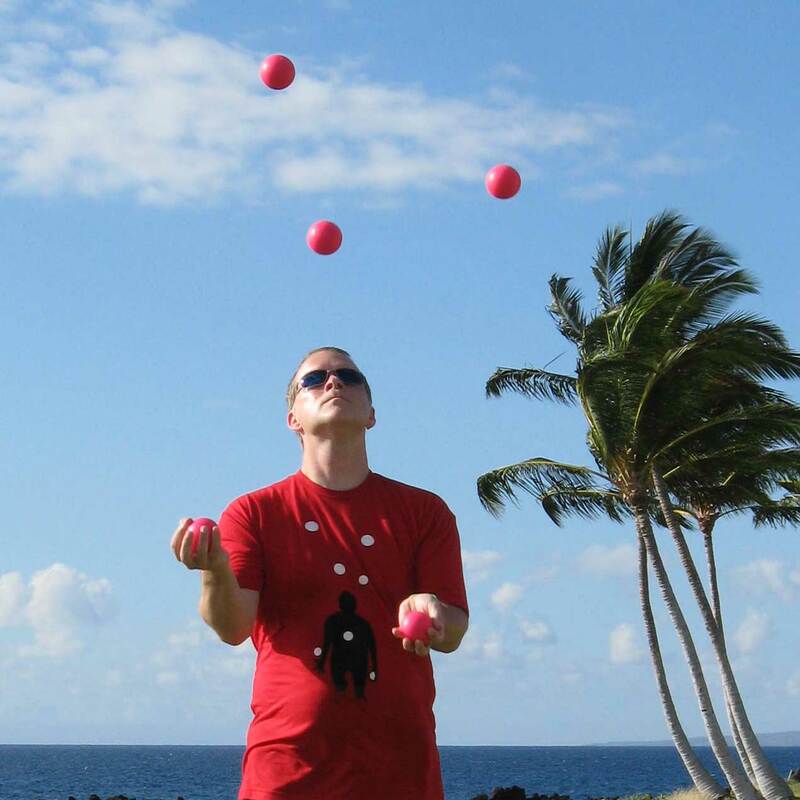 Dave returned to the world of juggling in 2010 after a 20 year hiatus. He currently chairs the Board of Directors of the IJA, teaches juggling to middle school kids, and is a spectacularly average juggler. In his real life, he lives in the Bay Area, CA and is a software engineer, working on Yahoo! Fantasy Sports.